Participation in international and regional forums is an important aspect of stakeholder engagement, providing platforms to share our progress and lessons, and to listen and learn from other stakeholders. Here is an update on some recent forums in which APRIL has participated. APRIL was proud to receive recognition for its work with Riau communities to eliminate fire and for its peatland restoration efforts at the Sustainable Business Awards, held at the Fullerton Hotel in Singapore on 27 July. APRIL was judged the winner in two award categories. The Best Sustainability in the Community Award recognised the success of the company’s Fire Free Village Program, which has worked with 27 villages, spanning an area of over 600,000 hectares, since 2014 to promote a fire free landscape through education, capability building and infrastructure awards. 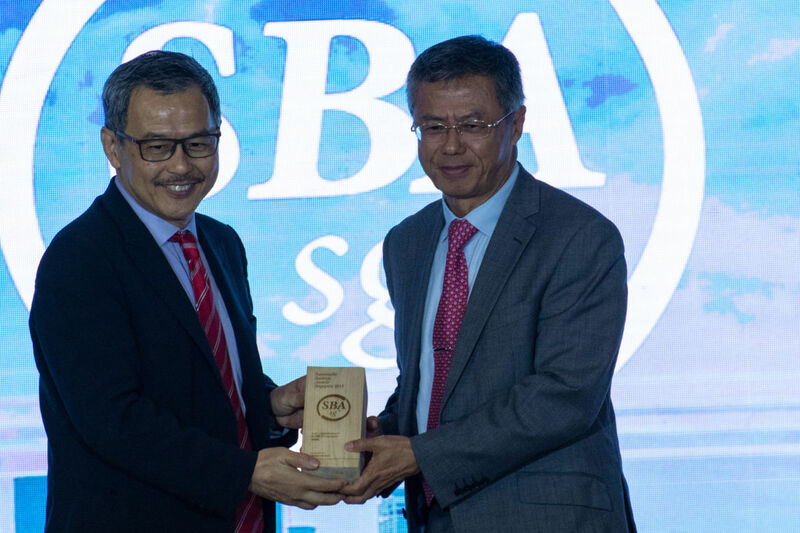 Mr. Bey Soo Khiang, Chairman, APRIL Group (right), receiving one of APRIL’s awards at the Sustainable Business Awards in Singapore. The second award called out APRIL’s ecosystem restoration project, Restorasi Ekosistem Riau (RER) as a Special Recognition Best Flagship Initiative. RER is working to restore and protect 150,000 hectares of peatland forest on Sumatra’s Kampar Peninsula and Padang Island in partnership with Fauna & Flora International and social NGO, BIDARA on community engagement. Last month, RGE Director Anderson Tanoto, and APRIL Director of Sustainability and External Affairs, Lucita Jasmin, participated in the Oslo Tropical Forest Forum in Norway. Anderson contributed to a discussion centering on what it will take to achieve the ’no deforestation targets in the 2020 New York Declaration on Forests and 2030 Sustainable Development Goals (SDGs). He spoke alongside Ministers and senior representatives from the Colombian, Ecuadorian, Congolese and Indonesia governments, and Norwegian fertiliser giant, Yara. The debate looked closely at the progress made by private sector companies as well as the actions taken by governments where resources continue to come under pressure due to population growth and development needs. Later that day, Lucita Jasmin participated in a fishbowl session alongside global sustainability experts from the UNDP, Rainforest Alliance, Consumer Goods Forum and Tropical Forest Alliance, to debate the acceleration of the No-Deforestation, No Peat, No Exploitation (NDPE) commodity commitments, and their contribution to the achievement of 2020 targets. The solution-focused session includes a range of perspectives, with a focus on the need for greater partnership and collaboration to ensure landscape actors achieve time-bound targets. In the same week, APRIL Group Chairman, Mr. Bey Soo Khiang, represented APRIL at a Conservation Finance Roundtable at the Global Environment Facility Assembly, in Da Nang, Vietnam. Mr. Bey spoke about how companies like APRIL are employing strategies to balance production and protection in a way that meets the needs of business, economy and community, without negatively impacting the environment. He also referenced the company’s alignment to the UN’s Sustainable Development Goals. In May, Lucita spoke at the 5th Singapore Dialog on Sustainable World Resources, on a panel discussion focused on Sustainability Reporting in the Plantation Sector, and its ability to attract better capital flows. The session touched on the importance of reporting not being a substitute for real action, the need to ensure independent third party verification, and the value of UN’s Sustainable Development Goals as a unifying framework for aligning commitments with the global development agenda.